Exceptional sound and comfortable, proprietary tips that also give you incredible stability. Bose in-ear IE2 headphones are setting a new standard for sound performance that more conventional earbuds can't match. Re-engineered from the inside out, they feature an enhanced acoustic design that helps music sound smoother and more natural. Quality construction combines a secure fit with durability, making these headphones ideal for music whenever you want, wherever you go, and there are options for mobile phone calling and remote music control as well. 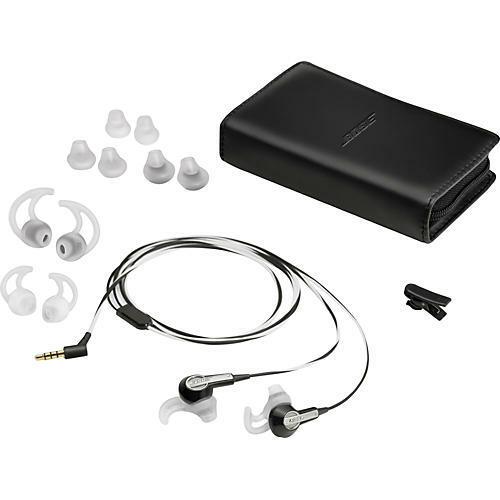 Bose IE2 headphones reproduce music with more range and realism than most typical earbuds. A modified port design, in concert with their proprietary TriPort acoustic headphone structure results in a richer audio performance. You'll hear natural-sounding lows, musical clarity”even at louder volumes”and an overall presence you'd expect from much larger headphones. For greater stability, even during exercise and other active sports, IE2 in-ear headphones feature proprietary StayHear silicone tips. Advanced materials and design allow the tips to nestle inside the bowl of the ear while also naturally conforming to the ear's upper ridge. The tips come in three sizes for hours of comfortable listening. StayHear tips are also designed to remain more securely on the headphone itself. Overall, they provide a better on-the-go listening experience. Advanced materials and construction make our in-ear headphones sturdier than ever. Each pair undergoes rigorous testing to meet Bose standards for performance and durability, resulting in lasting quality for you. Enjoy your music for long periods of time with the IE2 Audio Headphones. Order today!